The real estate market in Vancouver has been on a tear for 20 years now. Many pundits and experts are calling it a bubble, others are say Vancouver land is scarce and will have long term demand. I’ll chose not to try and predict the future, but rather propose a discussion on what we should do if the market runs into trouble. It’s important to be prepared and have a plan as recess,ions have a way of hitting much quicker than recoveries. The Vancouver 2010 Olympics were perfectly timed, as right in the middle of the 2008 global financial crisis we were in build mode and the economy had some guaranteed money pushing it. Next time, lets be ready with a plan that’s ready to roll. Vancouver housing development has been driving the economy of this city. Any disruption to development would have extremely serious consequences for our economy, and with our smug reputation I doubt we’d get much sympathy. So lets picture a setback to the market triggered either internally or externally. Through luck or good planning, Vancouver has a store of housing stock worth a huge amount that can be used to counteract any market correction. Looking around Vancouver, a city bordered by water on 3 sides you may ask where that valuable land is, and no, I’m not proposing we develop the Endowment Lands or Stanley Park. Vancouver zoning laws have protected the character of West Side neighborhoods from density increasing develpments throughout the past 100 years of growth. I’m calling to question what is being protected! In the 1980’s my family moved to 29th and Granville, Shaughnessy… Our 100 by 180 foot lot and giant house were upper middle class, there is no doubt. It was a community when we got there. There were neighbourhood barbecues and kids playing in the parks on on the streets. Through the 90’s though, families moved out and the community atmosphere faded away. As my generation grew up, the scramble to get onto the housing ladder drew our attention to the East Side. Neighborhoods like Main and Commercial Drive became the home of hipsters, the places to be, and communities with character. As development continued, even these new areas became unaffordable for young families. A curious distortion occurred, with East Side homes selling for $1M on 33 by 120 lots, or $250 / sq foot, they became more expensive than West side homes at $3M, but only $165 / sq foot. As it stands now, the East Side still lives on it’s fundamentals. Even buying a million dollar house can make sense. Between the low interest rates and a mortgage helper in the basement, a family could economically justify owning a house for the long term. The West side of Vancouver is another story. Prices have more than caught up to the East Side, yet the market is being driven by different forces than on the East side. Home are being purchased for $3M – $7M yet can command rents of little more than the east side. Besides the simple math of rents, another way we know that the markets aren’t functioning on fundamentals is that Vacancy rates accross the West side are increasing. There is plenty of corroborating evidence for this as well, as West side traffic is virtually non existent past Burrard Street. So we have a West side market based on speculative money. Investors are chasing commodity prices rises, much like we’ve seen in Gold markets, instead of investing in homes based on the fundamentals of economic rent. I’d describe this as a bubble but that’s just provocative. The fact is, this ‘bubble’ has been fuelling the Vancouver economy nicely for some time and it would be fantastic if it could be sustained through any shock that may occur. So back to the space Vancouver has available. It’s the zoning protected densities of the West Side. The chart above shoes population densities of Vancouver. The catalysts that has been Yaletown and then Mount Pleasant is what’s driven Vancouver to the top of world wide livablility charts. 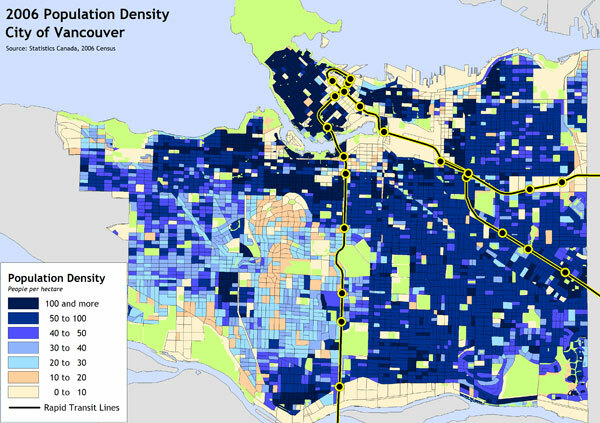 We can also see Kits and Kerrisdale on the map here with solid density, and both are recognized as fantastic communities to live in. The city has already announced that the Cambie corridore is ripe for development, and that will be fantastic with the Subway running through it. The West side should be next. If the market sours, we risk so much in our city. A collapse in housing prices would totally derail the Vancouver economy. Instead of letting us fall to that fate, lets continue the trend that’s making Vancouver what it is, and transform Shaughnessy and the rest of the West Side into vibrant communities again. By opening up zoning to density in these highly sought after communities it would likely outstrip any downside forces limiting development and keep our economy rolling. At the same time, it would continue a fantastic trend in our city that has seen us embrace modern and more sustainable living,. I heard recently that, “The city would never do that as it protects communities.” The only thing the city is protecting is exclusivity, and it’s killing the West Side. Vacancy and low density are both a waste and unsustainable. Luckily, the desirability of the West Side will not go anywhere, so that is why even in a downturn, a quick change in zoning can be all the stimulus we’ll need.